The sibyls were women that the ancient Greeks believed were oracles. The earliest sibyls, according to legend, prophesied at holy sites. Their prophecies were influenced by divine inspiration from a deity; originally at Delphi and Pessinos, the deities were chthonic deities. In later antiquity, various writers attested to the existence of sibyls in Greece, Italy, the Levant, and Asia Minor. The English word sibyl ( or /ˈsɪbɪl/) comes — via the Old French sibile and the Latin sibylla — from the ancient Greek σίβυλλα (sibulla, plural σίβυλλαι sibullai). Varro derived the name from theobule ("divine counsel"), but modern philologists mostly propose an Old Italic or alternatively a Semitic etymology. In Pausanias, Description of Greece, the first sibyl at Delphi mentioned ("the former" [earlier]) was of great antiquity, and was thought, according to Pausanias, to have been given the name "sibyl" by the Libyans. Sir James Frazer calls the text defective. The second sibyl referred to by Pausanias, and named "Herophile", seems to have been based ultimately in Samos, but visited other shrines, at Clarus. Delos and Delphi and sang there, but that at the same time, Delphi had its own sibyl. James Frazer writes, in his translation and commentary on Pausanias, that only two of the Greek sibyls were historical: Herophile of Erythrae, who is thought to have lived in the 8th century BC, and Phyto of Samos who lived somewhat later. He observes that the Greeks at first seemed to have known only one sibyl, and instances Heraclides Ponticus as the first ancient writer to distinguish several sibyls: Heraclitus names at least three sibyls, the Phrygian, the Erythraean, and the Hellespontine. The scholar David S. Potter writes, "In the late fifth century BC it does appear that 'Sibylla' was the name given to a single inspired prophetess". Like Heraclitus, Plato speaks of only one sibyl, but in course of time the number increased to nine, with a tenth, the Tiburtine Sibyl, probably Etruscan in origin, added by the Romans. According to Lactantius' Divine Institutions (i.6, 4th century AD, quoting from a lost work of Varro, 1st century BC) these ten sibyls were those in the following list. Of them, the three most famous sibyls throughout their long career were the Delphic, the Erythraean and the Cumaean. Not all the following sibyls were securely identified with an oracular shrine, and in the vague and shifting Christian picture there is some overlap. "brought up in Palestine named Sabbe, whose father was Berosus and her mother Erymanthe. Some say she was a Babylonian, while others call her an Egyptian Sibyl." The so-called Libyan Sibyl was identified with prophetic priestess presiding over the ancient Zeus-Amon (Zeus represented with the horns of Amon) oracle at the Siwa Oasis in the Western Desert of Egypt. The oracle here was consulted by Alexander after his conquest of Egypt. The mother of the Libyan Sibyl was Lamia, meaning "devourer". Euripides mentions the Libyan Sibyl in the prologue to his tragedy Lamia. The Delphic Sibyl was a legendary figure who gave prophecies in the sacred precinct of Apollo at Delphi, located on the slopes of Mount Parnassus. Pausanias claimed that the Sibyl was "born between man and goddess, daughter of sea monsters and an immortal nymph". Others said she was sister or daughter to Apollo. Still others claimed the Sibyl received her powers from Gaia originally, who passed the oracle to Themis, who passed it to Phoebe. The Delphic Sibyl has sometimes been confused with the Pythia, the priestess of Apollo who gave prophecies at the Delphic Oracle. The two are not identical, and should be treated as separate figures. 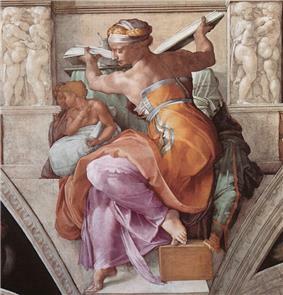 The sibyl who most concerned the Romans was the Cumaean Sibyl, located near the Greek city of Naples, whom Virgil's Aeneas consults before his descent to the lower world (Aeneid book VI: 10). Burkert notes (1985, p 117) that the conquest of Cumae by the Oscans in the 5th century destroyed the tradition, but provides a terminus ante quem for a Cumaean sibyl. It was she who supposedly sold to Tarquinius Superbus, the last king of Rome, the original Sibylline books. Christians were especially impressed with the Cumaean Sibyl, for in Virgil's Fourth Eclogue she foretells the coming of a savior – possibly a flattering reference to the poet's patron – whom Christians identified as Jesus. The Phrygian Sibyl is most well-known for being conflated with Cassandra, Priam's daughter in Homer's Iliad. 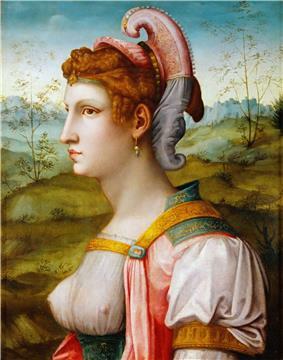 The Phrygian Sibyl appears to be a doublet of the Hellespontine Sibyl. An apocalyptic pseudo-prophecy exists, attributed to the Tiburtine Sibyl, written c. 380 CE, but with revisions and interpolations added at later dates. It purports to prophesy the advent of a final Emperor named Constans, vanquishing the foes of Christianity, bringing about a period of great wealth and peace, ending paganism and converting the Jews. After vanquishing Gog and Magog, the Emperor is said to resign his crown to God. This would give way to the Antichrist. Ippolito d'Este rebuilt the Villa d'Este at Tibur, the modern Tivoli, from 1550 onward, and commissioned elaborate fresco murals in the Villa that celebrate the Tiburtine Sibyl, as prophesying the birth of Christ to the classical world. The best known depiction is that of Borgia apartments of the Vatican, engraved by Baccio Baldini, a contemporary of Botticelli, and graffites by Matteo di Giovanni in the pavement of the Duomo of Siena. The sayings of sibyls and oracles were notoriously open to interpretation (compare Nostradamus) and were constantly used for both civil and cult propaganda. These sayings and sibyls should not to be confused with the extant 6th-century collection of Sibylline Oracles, which typically predict disasters rather than prescribe solutions. ^ "Since Lactantius expressly says (l.c. ["Divinarum Institutionum," i. 6]) that the sibyl is a native of Babylon, the name is probably Semitic in origin. The word may be resolved into the two components "sib" + "il," thus denoting "the ancient of god" (Krauss, in "Byzantinische Zeit." xi. 122)"
At first, the Greeks seemed to have known only one sibyl. (Heraclitus, cited by Plutarch, De Pythiae Oraculis 6; Aristophanes, Peace 1095, 1116; Plato, Phaedrus, p.244b). The first writer who is known to have distinguished several sibyls is Heraclitus Ponticus in his book On Oracles, in which he appears to have enumerated at least three, namely the Phrygian, the Erythraean, and the Hellespontine. 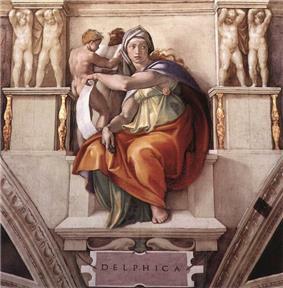 ^ For example, Broad 2006, p. 3, who mistakes Michelangelo's painting of the Delphic Sibyl on the Sistine Chapel ceiling as an image of the Pythia. ^ The Latin Tiburtine Sibyl. History 3850 Readings. Retrieved on June 20, 2008. The Waste LandT.S. Eliot's is prefaced by a quote from Petronius' Satyricon (1st century AD) The passage translates roughly as "I saw with my own eyes the Sibyl at Cumae hanging in a jar, and when the boys said to her 'Sibyl, what do you want?' that one replied 'I want to die'.